First Line: The music started. When one of their friends gets married, a group of old university friends decides to leave London and travel to Shetland to celebrate. One of the group-- Eleanor-- claims to have seen the ghost of Peerie Lizzie, a local child who drowned in the 1920s. Then Eleanor simply vanishes into thin air. Detectives Jimmy Perez and Willow Reeves are sent to investigate, and once they hear about Peerie Lizzie they begin to believe that there's more to Eleanor's disappearance than first meets the eye. What if there's a secret hidden behind the myth of the drowned child-- a secret that someone would kill to protect? Author Ann Cleeves always sheds light on some facet of Shetland life. In Thin Air it's hamefarin or homecoming-- a time for expatriates return home to celebrate their roots. What better thing to do than bring a group of outsiders to Shetland who don't necessarily get along with each other? And who better to investigate the disappearance of one of them than Detective Jimmy Perez? Although Jimmy is still in mourning for his wife, fellow detective Willow Reeves is attracted to him, and it's interesting to watch her emotions play out throughout the book. Jimmy is his usual (rather) enigmatic self, getting the job done with a minimum of fuss or even notice. Perez is so unobtrusive about what he does that he leaves people wondering how he's made them all so dependent on him. While we're dealing with Shetland's fog which is affecting the ferry and plane schedules (and making us feel claustrophobic), Perez does his job. Endless rounds of going to people and listening to what they say, how they say it, and what they don't say. Few fictional detectives can listen to the degree that Jimmy Perez can. And few fictional detectives have the other characters wondering "how [Perez] managed to win people over. Perhaps it was something as simple as kindness." Indeed, it is kindness. Thin Air is a very quiet mystery, muffled in fog and shrouded in secrecy. It's as quiet and deceptive as Jimmy Perez himself-- and every bit as satisfying. 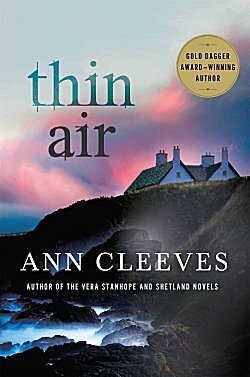 If you have yet to read one of Ann Cleeve's Shetland novels, I urge you to begin at the beginning with Raven Black. If you're well acquainted with Jimmy Perez, I have good news. This is another excellent addition to the series. Dig in. This was already on my wish list, Cathy, and it's still most definitely there after reading your review. Cleeves does such a good job, doesn't she, of building atmosphere and revealing layers of character. It's one of the things I like about her writing. Right now I am making an effort to read some of the books I have at home. So a few days ago, I went through my TBR books and pulled a few out to read next. They were a Charlaine Harris book, a Kate Ellis book, a Harlan Coben(Myron Bolitar)and a Julia Spencer-Fleming book. Now I am going to trot upstairs and look for Red Bones(Shetland) by Ann Cleeves. I have so many good books at home to read but The Lake House by Kate Morton is at the library and is tempting me. So for right now I ah still on track to read these books. Something tells me you'd like to take a look at my TBR books as much as I'd like to take a look at yours! This is really off topic but I see that you are now reading The Return of the Raven Mocker by Donis Casey. I really like the cover! The entire series is one of my favorites. In Raven Mocker, Alafair not only has two sons in Europe during World War I, she's fighting the influenza pandemic there in Boynton, Oklahoma. And of course there are some suspicious deaths!